Two WRC teams Toyota Gazoo Racing and Citroën Racing officially announced their line-ups for the 2019 FIA World Championship season today, confirming rumours from the previous weeks. Kris Meeke will return to the championship with Toyota Gazoo Racing, joining current Toyota representatives Ott Tanak and Jari-Matti Latvala as full-time drivers of the Japanese team. While Tanak and Latvala will stay with their respective navigators Martin Järveoja and Miikka Anttila, Meeke will have a new co-driver after ending a cooperation with Paul Nagle. Kris Meeke already tested a Toyota Yaris WRC, earlier this week in Finland. “It’s a huge pleasure and honour for me to become a Toyota driver. I’d like to thank Akio Toyoda, Tommi Mäkinen and the entire Toyota team for their faith in me. Three years ago, we first discussed the possibility of me joining the team, and I’m so happy that it’s finally happened now. The performance of the Yaris WRC speaks for itself, but the team spirit here is incredible at every level, also with the Japanese culture of honour and respect. I can’t wait to get started. I’ve got no particular objectives other than to enjoy my driving again and help Toyota to win a championship. The very first championship that I won was actually when I was aged 16 and co-driving for my brother on our local road rally championship. We clinched that title in a Toyota Corolla, so for very many reasons, it feels incredibly good to be here. I can’t think of a better place to be,” Kris Meeke said. Toyota Team Principal Tommi Mäkinen added: “We are all very excited to have Kris joining us here at Toyota Gazoo Racing. We know that he is very fast, but he also brings a lot of experience. His technical understanding is at a really high level and I believe he can provide new knowledge and ideas to help us in our aim to keep making the Yaris WRC better. After being sacked from Citroen Racing earlier this season, Meeke will return to WRC as a replacement for Esapekka Lappi. On the other side, Lappi will team up with Sebastien Ogier in a Citroën Total Abu Dhabi World Rally Team. 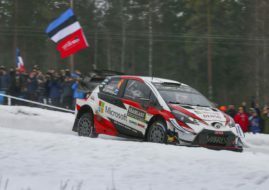 Citroen confirmed today that two-year deal with Lappi has been agreed. “It’s a good opportunity for me to keep improving. After having learned many things from Jari-Matti Latvala last year and from Ott Tänak this year, I’ll have everything it takes to be even better if I also manage to draw inspiration from Seb. I’m convinced the car has a lot of potential, as does the team, which has a long history and a lot of experience in the WRC. The fact that Pierre clearly wanted to recruit me also counted a lot when it came to making my decision,” said Lappi. “We were keen to sign up two very competitive crews for next year and the arrival of Esapekka is therefore excellent news. Putting faith in young drivers has long been hard-wired in the DNA of our brand and Esapekka certainly has the ideal profile. Talented, determined and focused, he should form both a complementary and formidable pair with Sébastien. We feel there is still room for him to improve, so we’ll be doing what we can to get him in the best possible shape to help him continue his impressive rise through the ranks,” said Citroen Racing’s chief Pierre Budar.